We got three bunnies this Sunday from Kathleen who runs Hidden Haven Farm. I have two Jersey Woolies and a English Agouti. I was under the impression that the Jersey Woolies were Angoras. Apparently they are not but according to Wikipedia they are referred to as "Dwarf Angoras" in Europe and are actually from a line of Netherland Dwarf Rabbits crossed with French Angoras. The Jersey Woolies are very docile and love to be petted. 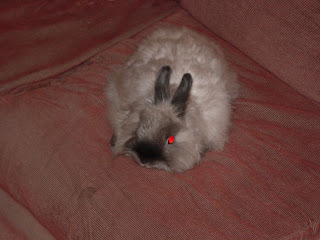 The angora is very jumpy though but we hope with additional attention she will calm down. Here are pictures and descriptions of the bunnies. This is Opal. She is a 4 year old Jersey Wooly. When we first got Opal back to the house my husband kept calling her Sable because of the color of her coat. Now I keep getting confused and calling her Sable when I mean Opal. *blushes guiltily* I kind of prefer the name Sable but after 4 years it seems like it would be wrong to just change poor Opal's name. Opal's hair is somewhat coarse so I wont be using it to spin or anything. This is Smokey Joe. He is a 4 year old Jersey Wooly. He has a grayish colored coat with a streak of darker gray that parts his body. 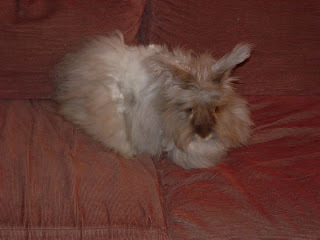 We are having to clean him up some due to a few mats that he has started to grow. I think that he still has a workable coat for spinning. Its almost as soft as the angoras. I will have to look into whether that is appropriate obviously but if its possible I probably will. This is Ladybird. Another name change occurred similar to with Opal. DH called her Lulubell. I think it fits quite well if you ask me. While I started to remember that Opal is not Sable, Lulubell has kinda stuck in my head. 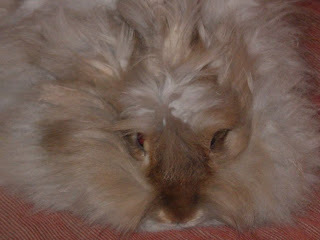 This bunny is a pedigreed English Opal Agouti. She has quite a few mats and we are working on cutting them out now. (Thats why there is a white area along her back.) She has grey hair on her. The first picture is a dead on face shot the second is one of her whole body. She is so long and fluffy! If anyone has bunny pictures to show, please post a link in the comments. I also welcome any and all bunny advice. Okay, back to bunny cuddling! They are so lovely. Whether or not you will be able to spin them, they will be greatly loved. 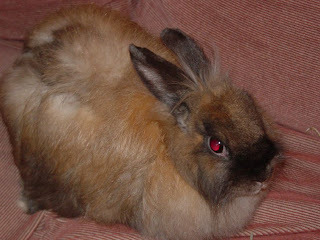 I have no bunny advice, although when in high school, my daughter kept a Siamese Satin in her bedroom. She (the bunny, not daughter) used a litter box and like to watch tv with Nikki.